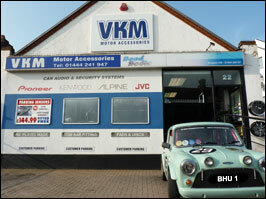 Out latest BHU Business Spotlight feature takes a look at VKM, the independent Motor Accessories store who have been established in Burgess Hill for over 4 decades. We're excited to be able to share with you the cracking service they offer their customers. VKM have been in business for 44 years. They've been in their current location of 22 Station Road for the past 24. The letters V.K.M are the initials of the three original directors, Victor, Kath and Michael. Another Michael - Michael Snuggs - is the owner and manager of the business. He has a team of 4 full-time workers and 1 part-time. VKM are open open 7 days a week. Their Sunday hours of trading are 9:30am-12:30pm. Why should the public come to VKM to buy their car parts and accessories over a national chain? Mick provides a simple answer to the question "Better service and better knowledge". All the VKM staff have been in the motor trade for a number of years and thus most of the time they'll be able to deal with your questions correctly and quicker than anyone else. The main business is replacement car parts and servicing components. Many parts are held in stock covering all the popular car manufacturers. You can also purchase car batteries, engine oil, coolant, screen wash, brake fluid, car care products, specialist motor trade tools, touch up paints, replacement numberplates, towbars and alarm keyfob batteries. VKM is essentially an Aladdin's cave full of useful things and people! VKM's success is down to their amazing customer service. There's a great vibe in the shop with witty banter between the staff and customers. It's a very friendly place to visit. Unsure if your battery is flat, dead or perhaps an issue with the alternator? VKM can tell you the answer. Your bulbs blown and you don't know how to replace it, VKM do. Many of your car problems have already been solved or dealt with by VKM over the years which often leads to a swift solution. So if you've got a car issue, pop in and see the chaps, they'll always be happy to give you their time which can often end up saving you a lot of money. How many years have VKM been in business? The closing date is Friday 28th March with the winner to be announced on March 30th.